Have you ever considered creating a legal document by yourself? Many people who consider going down this route cite lower financial costs as the main reason why. 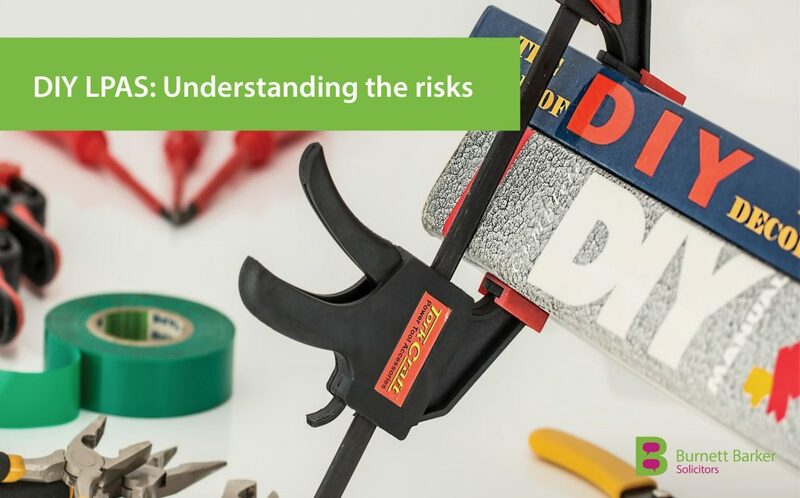 Yet whilst short term costs can indeed appear cheaper, there are a number of dangers in creating a DIY legal document, particularly one as important as an LPA, that can lead to further costs down the line – and not just financial. Similarly to the rise in ‘DIY divorces’, there is a growing market for DIY legal forms and online ‘kits’ that allow people to create legally binding documents themselves, without the involvement of a solicitor. However, doing so can open you up to a great deal of risk, according to a study recently carried out by Solicitors for the Elderly (SFE). It allows a person to choose one or more individuals (or ‘attorneys’) to handle their affairs in the event that they can no longer do so themselves, for example if they lose mental capacity. As such, an LPA is an extremely important document with serious implications for all involved. Attorneys are able to make important decisions on a number of areas involving the property, money, medical treatment and end of life wishes of the person making the LPA. Without a solicitor to provide independent advice and consultation on the contents and their wide-ranging legal implications, there is a danger of producing an LPA that is not fit for purpose. Omitting important wishes and preferences: It can be extremely daunting to think about what might happen if you lose the ability to make decisions for yourself. A vital part of a solicitor’s role is to provide counsel for an individual about their options and choices (for example, do you want your attorney to agree to life-sustaining treatment in the event of a medical crisis?). With DIY methods there is a danger that many wishes and preferences are not adequately expressed. Complex situations can be overlooked: Depending on individual circumstances, there may be a number of instances where complex affairs, including any business interests the person making an LPA may have, are not considered. The SFE’s study shows that consultation with a specialist LPA solicitor has many advantages over DIY methods when it comes to creating an LPA, and for the vast majority of people this remains the most effective and legally robust option for creating one. “When the solicitor told me exactly what authority I’d be giving up, I realised how powerful the LPA is.” . At Burnett Barker Solicitors we have specialists on hand to guide you through the process of making an LPA and can explain each section in a way that you will understand as well as probe you to consider aspects that you may not have thought about. Feel free to download our LPA factsheet or contact us directly on 01284 701131. You can also leave us a message here.